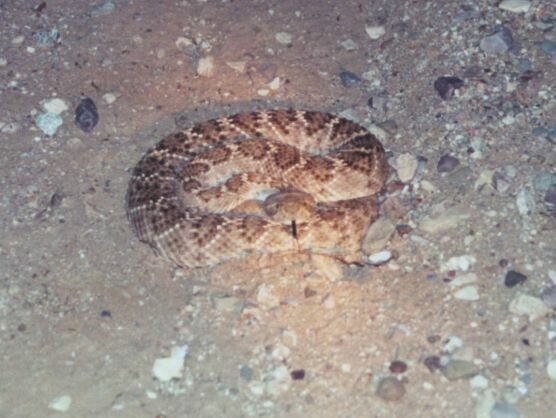 Just a few days after we posted the rattler (see previous page), I saw another rattlesnake curled up down a wash about 50 yards from the house. She wouldn't budge, even when gently lifted with a stick. I went back a few hours later, after it was dark, with Nadia and the camera, and she was still there. Maybe she was a pregnant female, too? She was very much alive, wagging her tongue at us and moving her head to watch our every move. We got a few photos and then left her alone. I'm a big fan of motherhood. 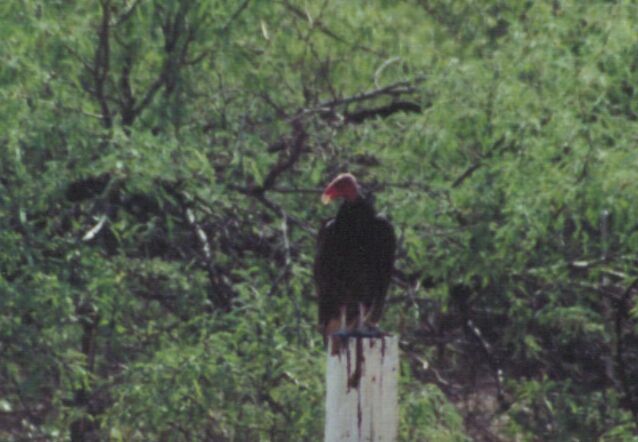 I threw what was left of the rattlesnake we posted out in the desert near the old corrals; the next day this turkey vulture was sitting on a post there, digesting it. Conditions can be unforgiving in the desert. The buzzards are already done with this unfortunate Hereford. All photos on this page were taken right around our house. Except for this one. 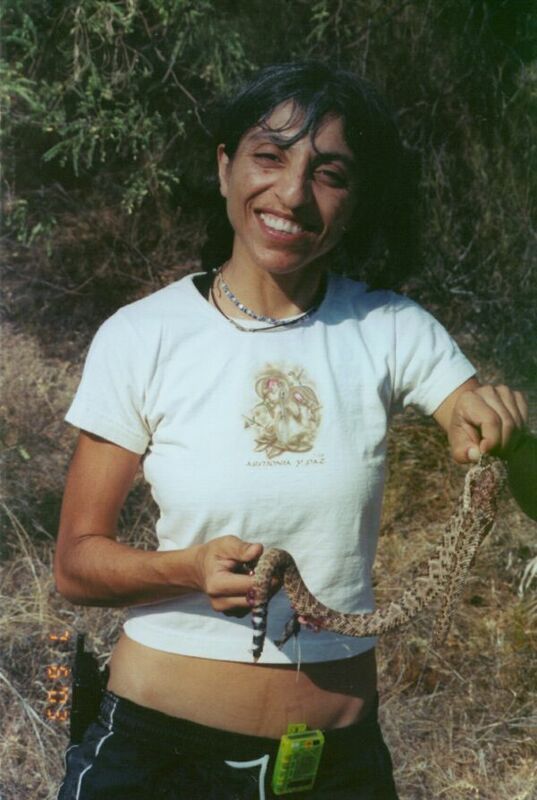 Nadia with another rattlesnake, this one was near Madera Canyon, 25 miles south. 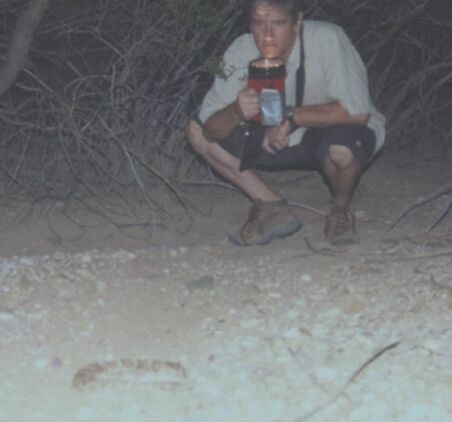 Please note: Fooling around with rattlesnakes is dangerous and not to be done by the novice. They can kill you. Nadia and I are trained animal handlers, which makes it sorta OK. She's only holding this one in such a careless fashion because its head is already removed. And she didn't want to get blood on her nice Costa Rica T-shirt. I've already gotten grief from my former students about these pictures, commenting on the dangerous handling techniques shown. 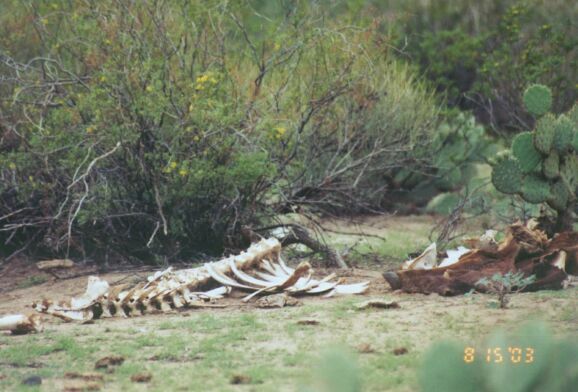 If the upshot of this page was that people went out and picked up rattlers and got bitten and there was this big public outcry and everybody started trying to kill all the rattlesnakes and made a negative impact on an important predator in the food chain around here, then that would stink. I'd recommend that the interested reader instead pick up a copy of Barbara Kingsolver's book, Prodigal Summer, for a factual and yet lyric discussion of the high importance of predators for our world. 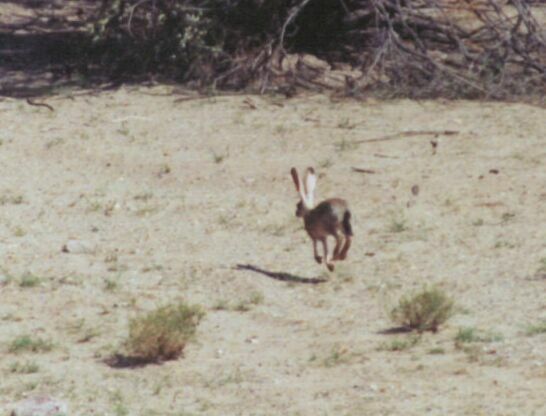 Jackrabbits are not easy to catch on film. They tend to hear you coming and they're pretty shy. And very fast. I caught this guy while hiking a quarter mile from my house with Barry the day we posted the snake. This Gila Monster was under some prickly pear right by our driveway. 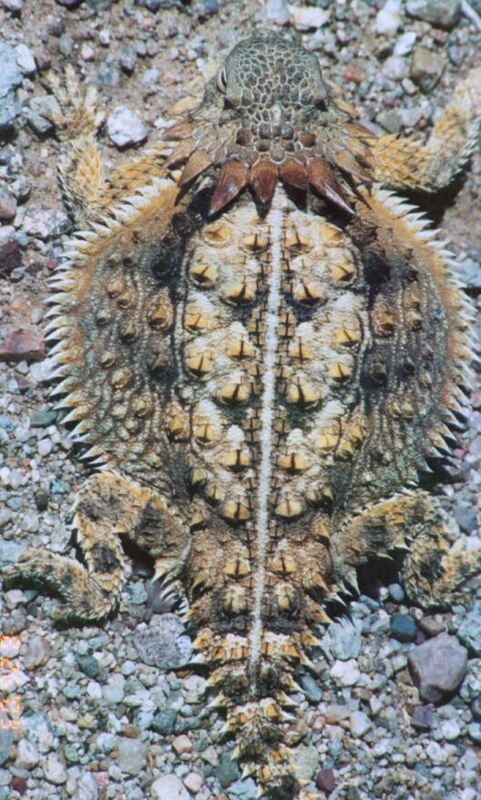 My dog Mojo found a horned lizard on the front porch the other day. He's gentle and didn't hurt it. 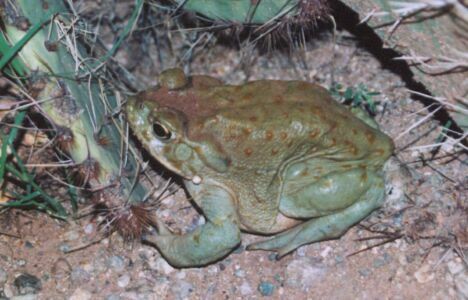 This has always been one of my favorite desert animals. 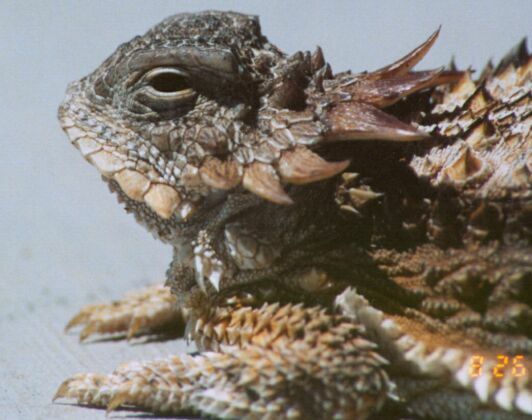 I grew up calling them "Horny toads." 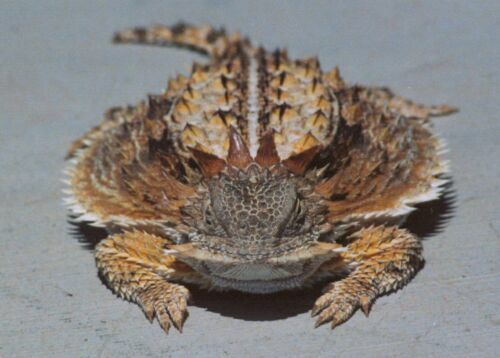 I believe this is actually the Regal Horned Lizard, Phrynosoma solare. 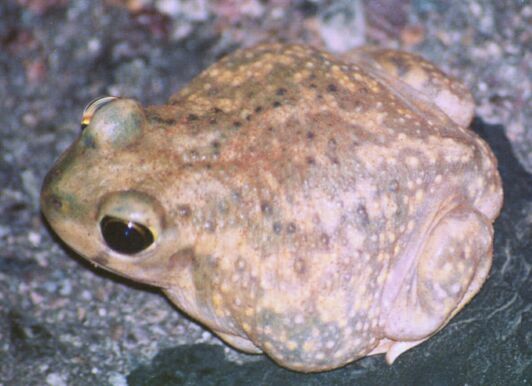 This little Colorado River Toad, Bufo alvarius, hopped across the road right in front of my car one night. 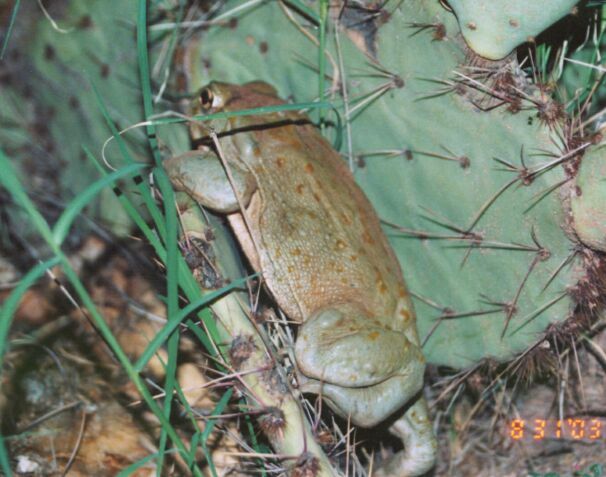 I was surprised that his wet amphibian skin could tolerate the prickly pear this well. That stuff really hurts me when I stick myself on it. A few nights later another one was hopping across the road. These guys come out in the summer with the arrival of the monsoon rains. Don't let your dog lick these, it makes them really sick.